Tucked away on a island between Goshen’s Millrace Canal and the Elkhart River, Red Tail Farm is where the city meets the countryside. Amenities are near at hand while you and your guests are surrounded by the relaxed and rustic mood of the countryside. Our farm is centered around a beautifully restored 1935 English three-bay threshing barn which we’ve updated with modern conveniences. 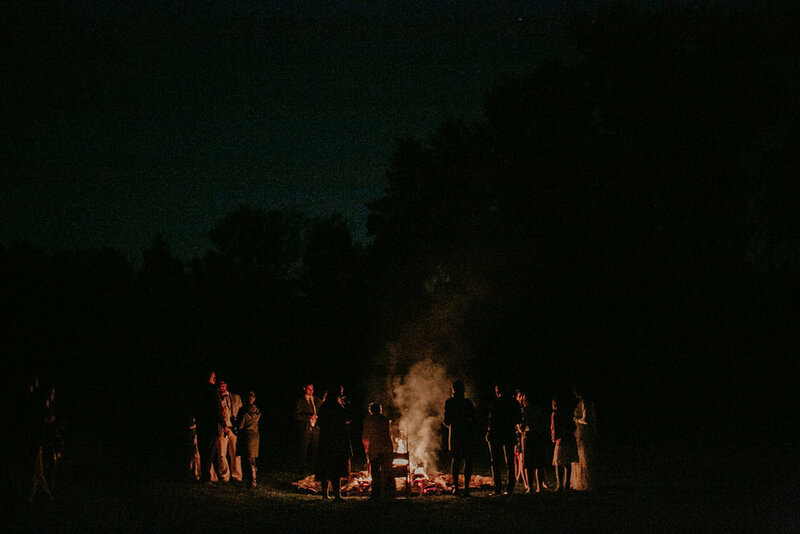 Surrounded by lush pastureland and forest, Red Tail also features an intimate outdoor ceremony grove and a grassy lawn perfect for games and bonfires. Planning a 2019 wedding? We still have dates available between May-October! Red Tail Farm is the perfect combination of natural beauty and rustic charm. The ceremony grove and barn were a perfect backdrop for everything we dreamt of in our wedding. Being surrounded by so much beauty made decorating easy! Working with Anna and Adam leading up to the wedding made me completely at ease. Anna’s ability to read people and respond to their needs is invaluable! I felt as though I had a friend and advocate leading me through important decisions and logistics. Anna and Adam’s authenticity and thoughtfulness is reflected not only in conversation, but also in the care and beauty of the venue itself.